No Name is a feminized indica dominant Marijuana strain created by crossing Cheese and Sensi Star. Very powerful effect, cerebral at first and physical after leaving you ready to go to sleep as a baby. 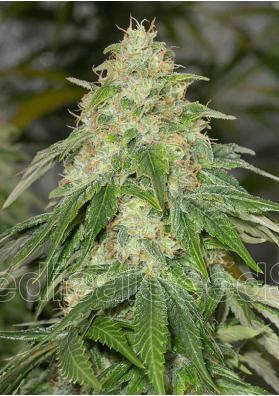 No Name is a feminized Indica dominant (80%) Marijuana strain created by crossing Cheese and Sensi Star. The effect of No Name is highly cerebral, followed by a great feeling of physical relaxation, nealy sedative, a kind of high that will leave you super relaxed and sleepy, Therefore, No Name is highly recommended to treat insomnia issues. In regard with taste, the characteristic and unique flavor of the Cheese is nuanced with liquorice undertones. The plant thrive well both indoors and outdoors althoug the productions are higher in the outside and and with a more intense taste. Despite having sativa genes, the flowering period is not long. In a growing room you will need to give it a growth period of 3-4 weeks to move to a bloom period of 55-65 days for a return of about 450 grams per square meter. In outdoors, the plant can reach 2 meters and in early October it will be ready to be collected offering interesting productions. In addition to all this, No Name is a multiawarded plant, winning the qst Prize at the 2009 Malaga Cannabis Cup, Bio category and the the 2nd Prize at the 2013 Canary Marijuana Cup 2013.